Despite all of the newfangled games out there for Canadian gamblers to peruse in their spare time, sometimes folks just want to get back to basics. The Triple Magic slot machine from Microgaming is one of the simplest and easiest slots out there, but it still provides outstanding entertainment with its theme based on sevens, bars, cherries and stars. 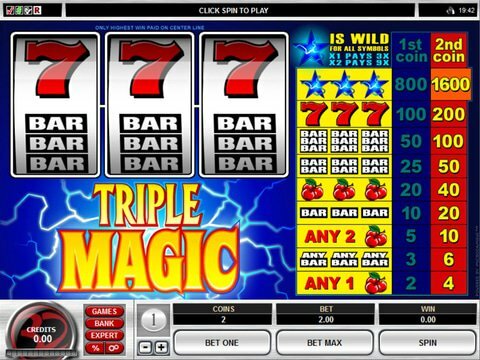 You can review it right here on this page with the Triple Magic free play slot demo that is available with no download and no registration. What's more, you can even play it on your favorite mobile device as long as you have a connection to the internet. Getting started with machines like this is simple; all you need to do is choose a bet amount and click "Spin". In Triple Magic, you can wager anything from a quarter to $10 as you try to win the $9000 jackpot. While most classic three-reel, single-payline slots like this are completely devoid of features, this one offers you a wild in the form of a Star that can double or even quadruple the winning combinations that it helps to create. Even better, there's a Cherry scatter that will provide you with a prize if you see one in any position at all on the payline. If you're a fan of classic slots but you're looking for something a little more unique for your real-money gambling, then Double Diamond from IGT is a great choice. With three reels and one payline on a pretty black-and-purple background, you'll want to see the diamonds on your screen since they act as wilds to double or quadruple whatever wins they complete. Three Diamonds will give you a jackpot win of $2500, too! The betting range starts at $1 and tops out at $3 per spin, so it's a decent return on your investment if you win.